With all the political and economic threats to the environment these days, Baptized into Wilderness: A Christian Perspective on John Muir is an important reminder of why we care for God’s creation. This book of environmental theology by Richard Austin is a classic, using the life and thoughts of John Muir, supreme naturalist and activist, to reflect on our intended place in God’s creation and God’s call to us to be its stewards. “As long as I live, I’ll hear waterfalls and birds and winds sing!” said Muir in 1871, when he came to a sense of himself and his vocation. Among other actions, Muir saved the Yosemite by persuading President Teddy Roosevelt to make it a national park, influencing Roosevelt to create more national parks, national monuments, and wildlife reserves, and established the Sierra Club as a potent environmental watchdog to this day. 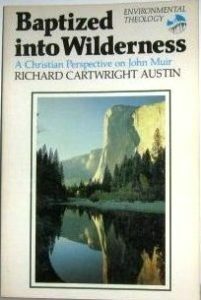 Baptized into Wilderness also gives glimpses of Muir’s awareness of wilderness and of natural history, and ponders it in the light of Christian Scriptures. He notes that Muir “tried to help humanity become part of wilderness, in order to save both,” encouraging us recognize our place in relation to nature, and particularly in relation to wilderness. The book lays out some biblical themes and texts, discusses how wildness suggests eternal moral standards to humanity, notes how human culture can relate to the earth in agriculture, and reminds us of the “natural sacraments” of the world and all creatures around us.